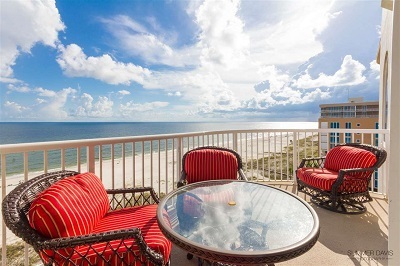 Perdido Key FL condominium home for sale at Spanish Key. This 4BR/4.5BA unit is sold furnished so, you can start putting $ back in your pocket as soon as you walk away with the key! No other condo on market can compare to what this unit & Spanish Key has to offer for owners & renters! Did you know this complex only has 75 units! There will be plenty of room for sunbathing on 500' along the beach! Spanish Key is an upscale complex but, gives you that coastal, welcoming feeling. You'll know that you are going to have a remember-able vacation as soon as you drive through the gates & enter the lobby. What will you do first? You walk out onto the boardwalk & put your feet in the sand & water or take a dip in the indoor or outdoor pool! Don't forget the sauna, 2 hot tubs, & gym that overlooks the pool & beach! Love to grill? You'll enjoy grilling your favorite dish under the gazebo with views of beach. Wet Bar, ice maker, wine chiller, pull-out drawers in kitchen cabinets, electric storm shutters, built-in bookcases, just to name a few more features!